Etiquette can be confusing. And complicated. And completely overwhelming. But, as you know, I think etiquette is also amazing and essential and always relevant. While you can read many books on the topic (which I absolutely LOVE to do! ), there is a simple golden rule that etiquette boils down to. Always strive to put others at ease. Intrinsically, it doesn't actually matter if you introduce an elder first, or use a fish knife, or stand when a lady leaves the room. The entire purpose of etiquette is to create an environment where people know what is expected of them and others, and that makes one feel safe and at ease in this knowledge. So how does this translate to actions you should take when interacting with others? You should never make anyone feel badly if they stumble. Nor should you have an air of superiority because you know how to act in accordance with archaic rules of etiquette. Rather, you should speak kindly, be supportive, and intentionally choose how you communicate. Etiquette has the power to elevate our lifestyle as we improve the way we interact with others. It can allow us to move through life gracefully and can enhance our professional and personal relationships. There's really not much more to say on the matter because to me it seems fairly intuitive. Don't get bogged down in rules and ceremony, instead focus on having positive interactions where everyone comes away from the situation feeling happy and as though they have gained something. As Emily Post said "Manners are a sensitive awareness of the feelings of others. If you have that awareness, you have good manners, no matter what fork you use." 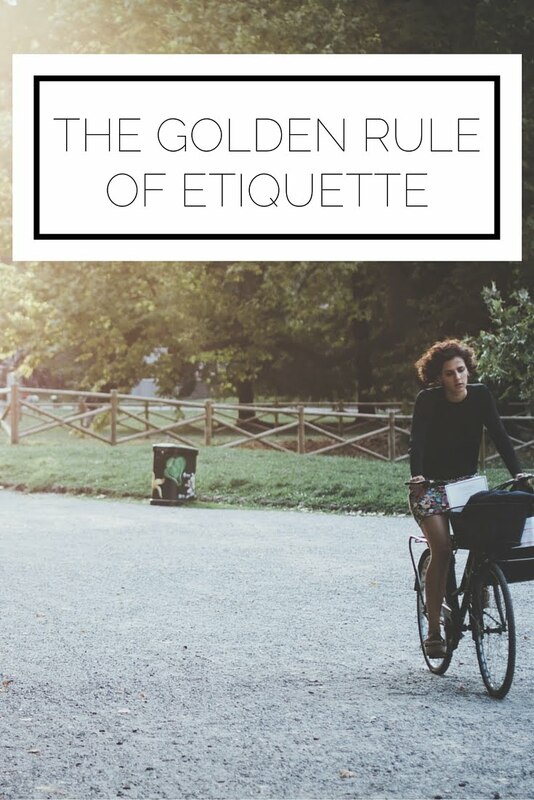 What are your thoughts on the golden rule of etiquette?